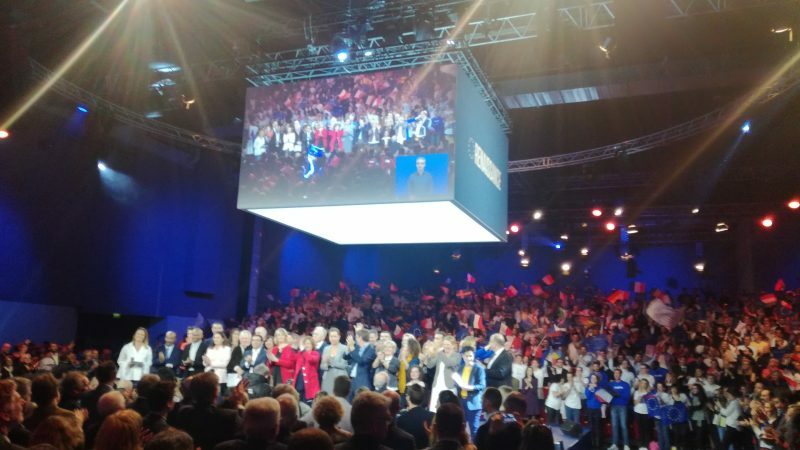 Party members of the LREM were welcomed on the Aubervilliers docks on 30 March for the first important campaign meeting in preparation for the European elections in May. In a festive musical atmosphere flooded by European flags, French flags and flags from other EU countries, the great masse started with a short video of Emmanuel Macron’s Sorbonne speech calling all the French – in particular the young generation – to embark on this slightly crazy dream of Europe. Led by Nathalie Loiseau, former minister of European affairs who took the reins of the “Renaissance” list, the Aubervilliers meeting had the ambition to launch the electoral campaign and present the relatively unknown former minister to the general public. But it also was an opportunity to present a certain unity with LREM’s political partners, including MoDem of François Bayrou, Agir of Franck Riester and the Radical Party of Laurent Enard, who have all made the trip to Aubervilliers. Their presence was meant to bring together the different movements that constitute the Renaissance list following difficult negotiations of the previous weeks to finalise the selection of the first 30 names of the list. More reinforcements: A large majority of government members made the trip to attend the meeting, notably Prime Minister Édouard Philippe. The stage entry of the top thirty candidates from the Renaissance list was greeted with applause. Other than Nathalie Loiseau, several other names also drew applause from party members. Former Minister for Development and head of the French section of WWF, Pascal Canfin (number 2), but also Stéphane Séjourné (number 6), who is both a candidate and campaign leader. Accelerating energy transition and industrial policy; harmonising fiscal policy and European defence policy; fostering new international relations; and revising migration policies. A green endorsement of the “Renaissance” list, Pascal Canfin, also reminded of the necessity to prioritise ecology at a European level, notably regarding the issue of changing the food production model. “We will run this project. We want to move away from the toxic cultural war between ecologists and farmers” he said while reaffirming his opposition to weedkiller glyphosate. It’s a sensitive subject for the presidential majority, as the failure of President Macron to prohibit the use of this herbicide in the short term, has damaged LREM ecological credibility. Another strong standpoint was the issue of trade relations between Europe and the US. “No, we will not sign a trade deal with a country that does not respect the Paris Agreement,” hammered Canfin. This promise was repeated by Loiseau in her closing statement. In its speeches on Europe, LREM had so far focused on the opposition of Marine le Pen and Rassemblement National, but this time, the rhetoric condemning the far-right party was completely absent from the meeting. Attacks against populists focused on those responsible for Brexit and Steve Bannon, a former Donald Trump adviser who is attempting to unite populists in Brussels. “The UK is leaving us without knowing where it is heading […] it wanted to retake control but lost its direction,” said Loiseau, who had announced her candidacy during a debate with Marine Le Pen. Yet, the name of LREM’s main opponent in the upcoming EU elections was not mentioned even once. Today, the two parties are neck and neck in the polls for the 26 May elections, even if LREM is seeing a small overall lead. Facing the rhetoric of Rassemblement National, Loiseau opted for a very accessible pro-European rhetoric, even if this meant political posturing. It was a way to move away from her image, seen as very technocratic by certain party members. Throughout her speech, Loiseau also repeated themes used by Emmanuel Macron in his article of 4 March: Climate urgency, migratory challenge, reinforcement of industrial policy and fiscal harmonisation. LREM’s final programme has yet to be revealed but should undoubtedly repeat these main themes.